Negative space describes the empty area that surrounds an object. It is also known as the background. If you struggle to understand this concept, the examples here may help to clarify that statement further. A simple pencil outline of a dwarf is depicted on the left. 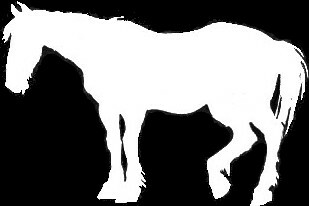 In the image on the right, the external (or negative) area has been darkened. A positive drawing is the object. A negative drawing is the space around the object. I sometimes use this area as an alternative for extra assistance when I'm having trouble with a particular subject that I'm trying to draw. On occasion, it's easier to identify with an odd shape than it is to correctly get the outline of a specific object so if you make use both negative and positive spaces, illustrations evolve naturally. After all, a drawing is nothing without the space around it, they go hand in hand with each other. The left side of the brain is always thinking and naming everything you depict. The right side of the brain is your creative base and doesn't require any type of information -- it identifies all things as shapes and tones. Are you ready to do an exercise with me? You really need a border around your drawings so you can easily identify the space. So, the first thing you need to do is to rule up a border on a piece of paper. Use the turtle image above as your copying subject/reference so try to keep the border to similar dimensions. Remember, you only need to concentrate on and copy the outline of gray area only. If you do it right, you should end up with a turtle shape (without even trying!). I copied around the gray shapes and estimated where the lines met each border line. For my own benefit, I finished the drawing off by adding a few minor details. The turtle outline below is what I finished up with. When you study the background of an object, the left brain just can't identify what it is so it puts itself to sleep which kind of forces the right brain to start work. That's why beginner artists are always told to stop naming things as they draw but instead just focus on copying shapes. It's good advice to get us into the habit of accessing the right brain early on and saves a lot of grief in the long run. To learn extra drawing tips and how to have fun with new techniques, simply sign up for the free newsletter, Sketchy News. Become a part of this self-taught community by entering your details in the boxes below. Years ago, silhouette drawings were very popular. The actual shapes of the subject were left completely white and the negative was black. I think they are quite attractive. Silhouette drawing is also done in reverse where the subject is totally black and the background is white. Ok, now you have the basics of drawing background shapes which enables the defining of positive shapes. To recognize negative space effectively, stare at a gap inside an object and eventually you become aware of the shape of that space. Another common method of identifying negative space around an object is to use a viewfinder. Try this exercise with anything from around the house, a cup would be easy for a start. The object you choose should have holes in it so you get a better idea of how negative space works. Teaching yourself to draw is a grand adventure and everything you do should be fun. If you don't like a particular exercise, don't force yourself to do it and don't worry about it because there are many more for you to choose from. It's your hobby so just enjoy it.